Zak Geis. Image via his Twitter. Welcome to episode 8 of Data Viz Today. How can you use a radar chart in an effective way? This episode features Zak Geis' eye-catching data viz inspired by radar charts. This is a difficult chart type to work with and this episode dives into its limitations and how best to implement it. 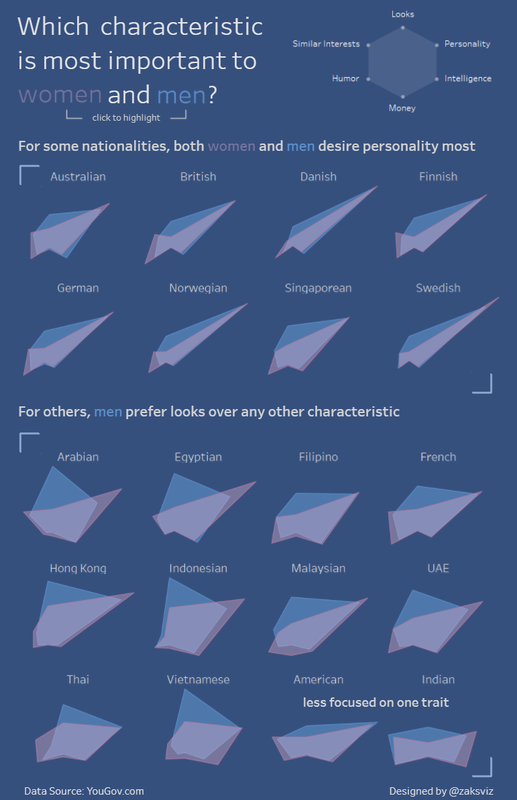 "Which Characteristic is Most Important to Women and Men" by Zak Geis. Image via his Tableau Public profile. 00:30 - It was a result of #MakeoverMonday. 01:40 - Zak is a Business Intelligence Solutions Architect at JP Morgan Chase based in Columbus, Ohio. 02:17 - Since there are six characteristics, he chose to use a radar chart. 02:30 - Radar charts use polar coordinate system with radii representing different variables and the distance from the center represents a metric. 03:50 - Tutorial that Zak used to create a radar chart in Tableau. 06:00 - Zak’s radar charts were success because he grouped them first by similar shapes, and he removed the grid lines to remind the reader that this wasn’t an exercise in precision - just general trends. A radar chart supposedly can give you the advantage of using different scales on each radius, like one variable could be measured in dollars, the next one could be a percent, but showing data in this way is confusing at best. Where you put your radius labels can be really misleading because it can be arbitrary. If you’re filling in the area underneath the line too, it can exacerbate this problem. When you have each radius or spoke representing a variable, and then are connecting a line from each one, then you’re implying some sort of connection between these variables, which might not be the case. Alberto Cairo uses an example that showed the voting results of a city and the neighborhoods were the radii which were arranged according to their geographical locations. So it acted as a compass of sorts and accompanied a choropleth map. 11:40 - For my inspired viz, I used Google Trends to get the data for search popularity of frappuccino. 13:40 - Final takeaway: radar charts are tricky but just know its limitations and your goals - then experiment away! 14:27 - Ensure you’re not misleading with your radar chart. 15:15 - Zak’s advice to new designers: try to absorb as much as you can from those that inspire you. Take the time to deconstruct a viz that you really like. Think about what’s done well? How did they create it? And How can I use what I’ve learned to better myself and my designs moving forward? And most importantly, practice! 15:40 - He’s looking forward to learning more about Flourish. 15:50 - Follow him on Twitter @zaksviz and check out his Tableau Public profile. 16:05 - Nominate a data viz! 16:13 - Follow me on Twitter @DataVizToday! New episodes are released every Tuesday at 6 AM EST. Our weekly newsletter delivers actionable tips from the show.